The process for the draw of lots for the special housing scheme for UT employees, floated by the Chandigarh Housing Board (CHB) in January 2008, has virtually been completed. Contrary to expectations of prospective allottees in Aerocity having an early windfall, the draw of lots can be possible only by mid-September. Two young men died in the wee hours of the morning today when they were hit by a rashly driven Skoda car (registration no: PB08AU 3333). Why Met forecasts go awry? Chandigarh, July 9 A 53-year-old senior accountant with the Punjab Accountant-General’s office at Sector 17 here was killed and two others injured when a truck rammed into a scooter and a rickshaw near the Centra Mall traffic lights here this morning. Like other mega-projects of the city, the Central Bureau of Investigation (CBI) is going to look into land allotment for the garbage processing plant to JP Associates by the municipal corporation (MC). Continuing with its efforts to make the Industrial Area free of violations, the UT estate office (EO) has served fresh notices on many industrial plots that have been misusing the premises and engaging in encroachment. 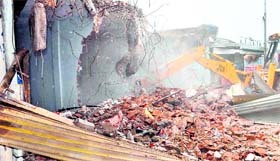 Cracking its whip on illegal structures in the Budhanpur colony located opposite Sector 16 in the city, the officials of the HUDA today demolished 10 illegal structures. If all goes to plan, the city will have its first day care centre especially for senior women citizens of the region by next month. The municipal corporation’s women empowerment committee approved the proposal at a meeting convened today. The Central Administrative Tribunal (CAT) has issued notices to Union of India, principal secretary of Punjab and Punjab DGP Paramdeep Singh Gill following an application filed by former DGP, PSEB Patiala, AP Pandey asking for higher pay scale as per new notification. The switching on and off of streetlights manually is soon going to be a thing of the past as the Municipal Corporation is contemplating to instal solar switches on the streetlights in the city. The Zirakpur Municipal Council has planned to spend Rs 40 lakh on the drainage system to remove waterlogging problem in Baltana, Zirakpur and the surrounding areas. The proposal has been mooted after the waterlogging problem faced by residential colonies in the recent rains. The project will be completed in three months. With an aim to train teachers of Adarsh Schools in latest teaching techniques, the Punjab State Education Board, in collaboration with Lovely Professional University, Jalandhar, organised a workshop here today. The National Consumer Awareness Group has accused the UT electricity department of harassing consumers. CBI Special Judge Darshan Singh has summoned sub-inspector Ramesh Kumar in a corruption case against Sanjeev Kumar, another cop. The case has been adjourned to July 19. Increasing the number of seats in the sports wing as compared to the last year, the Chandigarh sports department has allotted 378 seats in schools and 278 seats in the sports coaching centres this year. The last day of the trials for admission in the sports quota at various departments of Panjab University witnessed some heavy turnout of players. Start of the new “L” series saw the VIP number “0001” fetching Rs 3.25 lakh during the auction of “fancy” vehicle registration numbers held at the office of Mohali district transport officer (DTO) here today. Baby, a 40-year-old woman, succumbed to her injuries at PGI, Chandigarh, here, today. She had slipped from the staircase of her house on Thursday. Panjab University administration officials today released circulars relating to implementation of the Senate’s decision taken on April 4 to create additional seats as freeships for meritorious and poor students in various departments. For admission to 404 seats in Panjab University’s department of laws, the counselling kicked off here today. Counselling for the seat allotment at the PEC University of Technology will begin from tomorrow. 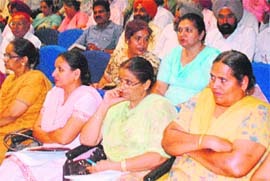 The first counselling will be till July 15 and the next counselling session would be held in July end, said officials. Hundreds of villagers of the Naggal area kept the body of Harbans Lal, private secretary of minister of Punjab, Sucha Singh Langha, on the middle of the road and blocked the Ambala-Hisar road near Matheri village this morning. They. They have been demanding registration of a case against the minister. One factory worker and four buffaloes were electrocuted in the Lalru and Dera Bassi areas today. Soon after being released on bail after being booked for suicide bid at the UT Police headquarters in Sector 9, the Sector-35 based two brothers had a clash with their neighbours at their residence last evening. Gurinder Singh of Punjab defeated city lad Deepinder Singh to clinch the title of HTA-AITA Men’s and Women’s Tournament 2010 at Ludhiana today. The Chandigarh Lawn Tennis Association (CLTA) will host the AITA Talent Series Tennis Tournament for boys and girls’ (under-12 and under-16 categories) from July 10 at the CLTA courts and Lake Complex here.